Mofaz says Netanyahu is perfect in intimidating Iran with a [military] blow and calls for the replacement of a government that is leading Israel into a "catastrophic" adventure. On a press conference held on Thursday 1st November 2012 Kadima party leader Shaul Mofaz told reporters the only thing prime minister Netanyahu cares about is 'bombing Iran'. "Last week the irresponsible man joined forces with an unrestrained man who has a messianic outlook – (Foreign Minister Avigdor) Lieberman, who threatened to bomb the Aswan Dam." 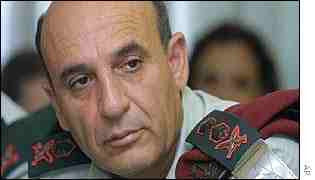 Mofaz warned that the Netanyahu-Lieberman union "is dangerous for Israel. He (Netanyahu) addressed the UN and promised us a nuclear spring. (Former Mossad chief) Meir Dagan fears it (attack on Iran), Yuval Diskin (ex-Shin Bet chief) fears it, (former IDF Chief of Staff Gabi) Ashkenazi fears it; every citizen fears it. In the past Israel dealt with threats in a reasonable manner. But here there is no responsibility and no logic, only one obsession. In war there are no winners; the question is who loses more." Shaul Mofaz (* 1948) is one of the most versatile figures in Israeli politics. He served different governments as Vice Prime Minister, Minister of Transportation and Defence Minister and he served in a series of senior military posts. As a Major General he was even appointed Chief of the General Staff in 1998. His term as Chief of Staff was noted for financial and structural reforms of the Israeli Army. He is now chairman of the Kadima Party, which is the largest party by seats in the current Knesset.